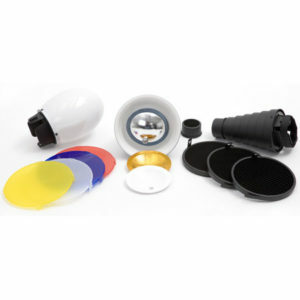 Adorama has released a speedlight accessory kit called the Flashpoint Q series. The components are secured to the flash with a band and a Velcro strap. The kit includes a variety of light modifiers making possible different lighting results using different combinations makes this kit a great addition to use with any standard shoe mounted flash, even when mounted on a light stand. 6-in 1 Flash Accessory Kit by Oh Gizmo!